University of Nebraska at Omaha students Jasmine Ayers and An Nguyen awarded U.S. Department of State's Benjamin A. Gilman International Scholarship to Study Abroad. 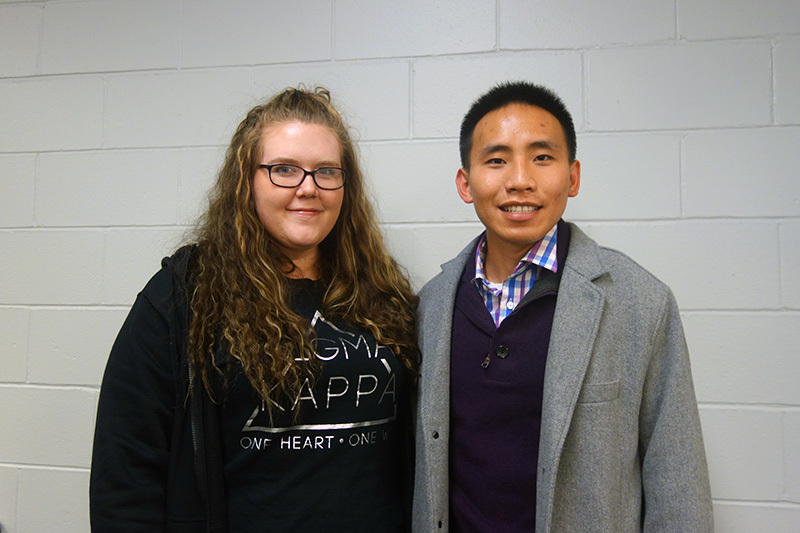 Jasmine Ayers and An Nguyen will both receive prestigious Benjamin A. Gilman International Scholarships to support their semesters studying abroad. Omaha, NE – Jasmine Ayers and An Nguyen at the University of Nebraska at Omaha (UNO) are two of over 850 American undergraduate students from 359 colleges and universities across the U.S. selected to receive the prestigious Benjamin A. Gilman International Scholarship, sponsored by the U.S. Department of State’s Bureau of Educational and Cultural Affairs to study or intern abroad during the spring 2017 term. Jasmine Ayers will study abroad on an exchange program at Masaryk University in Brno, Czech Republic. Jasmine is a first-generation student, a Thompson Learning Center (TLC) scholar, and studies Psychology at UNO. Jasmine says she hopes to come back completely changed, and that as a child she could never have imagined having this experience. An Nguyen will spend his semester studying abroad on exchange at the University of Coimbra in Coimbra, Portugal. An is a first-generation student, a Goodrich scholar, a Noyce Scholar, and studies Secondary Education and Mathematics. An also spent summer 2016 on the faculty-led History in Europe study abroad program in Italy. "I chose Portugal because it is a non-English speaking country; I have to get out of my comfort zone, and it provides a great environment for me to learn a new language," he explains. Gilman scholars receive up to $5,000 to apply towards their study abroad or internship program costs. The program offers grants for U.S. citizen undergraduate students of limited financial means to pursue academic studies or credit-bearing, career-oriented internships abroad. Such international exchange is intended to better prepare U.S. students to thrive in the global economy and interdependent world. Students receiving a Federal Pell Grant from two- and four-year institutions who will be studying abroad or participating in a career-oriented international internship for academic credit are eligible to apply. Scholarship recipients have the opportunity to gain a better understanding of other cultures, countries, languages, and economies -- making them better prepared to assume leadership roles within government and the private sector. The University of Coimbra and Masaryk University are both members of the MAUI-Utrecht network, a consortium of mid-American and European universities that support international exchange. The University of Nebraska at Omaha has thriving relationships with universities around the world which facilitate such exchange, allowing students to pay home tuition while attending a partner university. The Institute of International Education (IIE) is the world leader in the international exchange of people and ideas. An independent, nonprofit organization founded in 1919, the Institute is the world’s most experienced global higher education and professional exchange organization. IIE has a network of 19 offices worldwide working with more than 1,200 member institutions and over 6,000 individuals with a commitment to the internationalization of their institutions. IIE designs and implements programs of study and training for students, educators, young professionals and trainees from all sectors with funding from government and private sources. These programs include the Fulbright and Humphrey Fellowships administered for the U.S. Department of State. The Institute is a resource for educators and institutions worldwide (http://www.iie.org), publishing the Open Doors Report and operating www.IIEPassport.org and www.studyabroadfunding.org search engines for study abroad program and study abroad scholarships. For more information, please contact Lindsay Calvert, Director, Gilman International Scholarship, at 832-369-3481 or lcalvert@iie.org. Find out more about studying abroad with UNO Education Abroad.